This is a quick and tiny monument to all the guys of DeMolay. DeMolay is pretty small here in New Mexico, but it is growing, and I’m glad to see it. It is a very cool fraternal organization, for young men aged 12-21. I won’t go into the specific ideas and precepts here, even as little as I know and understand about them. Ultimately, DeMolay is about giving young men a foundation of ethics, morals, civic mindedness, and respect for fellows and family. If you are interested in knowing more, check out links at the bottom of the page. 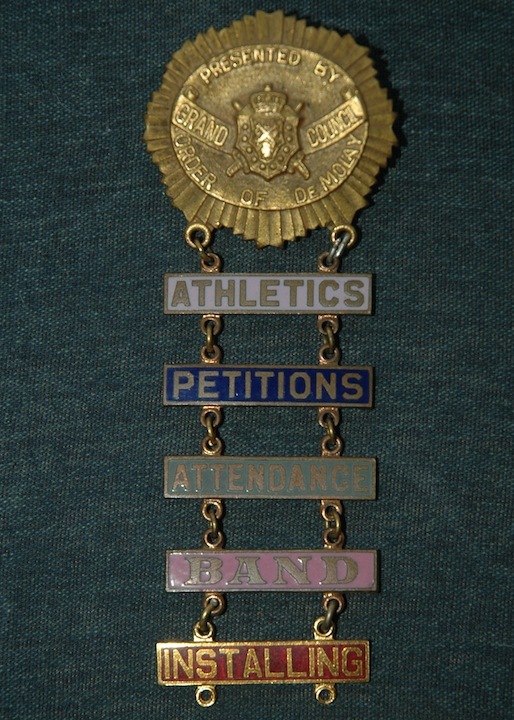 Here, instead and of course, are a few pieces from my collection that come from DeMolay. 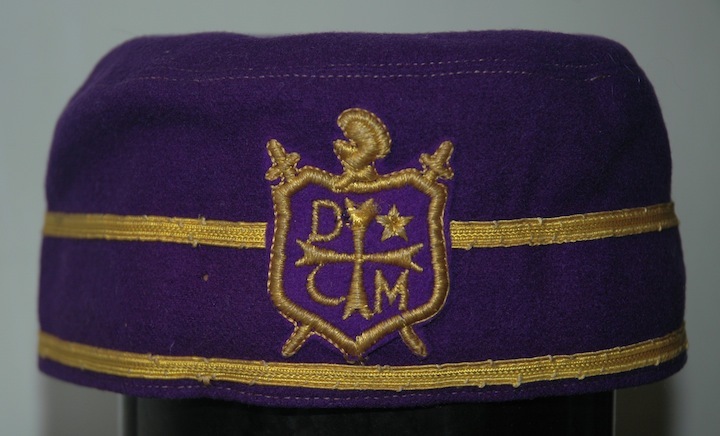 One very handy (and kind of odd) thing about The Order of DeMolay for Boys, at least from the collector’s point of view, is that the emblem of the order has changed several times. These changes are well documented, and we know when they occurred. Thus, we can get rough dates of DeMolay objects based on the emblem design they carry. Simple. 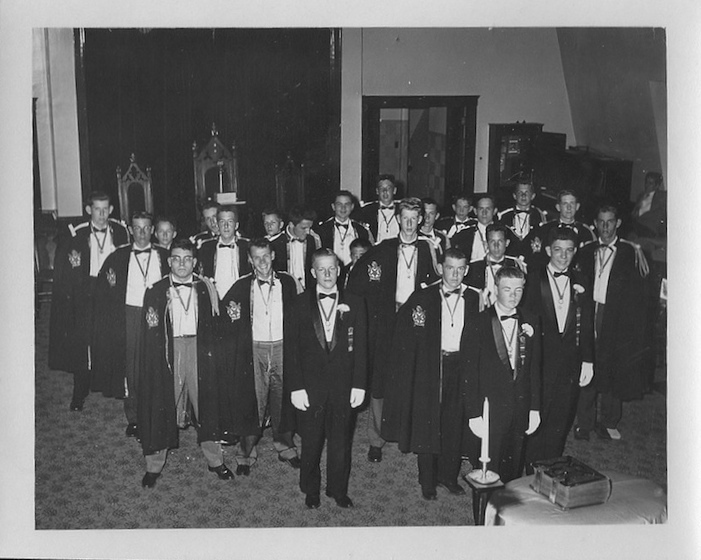 Frank Land, or “Dad” Land as he was called (adult advisors and chaperones in DeMolay are given the simple honorary title of “Dad”), was the founder of the organization in 1919, with an original compliment of 9 young men. The name comes from the last Grand Master of the Knights Templar, who was executed in 1314 for defying the pope and recanting his admission of heresy, which had been secured through torture. The style and schtick of the order revolves around knighthood, and the honors and responsibilities attached. Thus, the emblem of the order has always been heraldic. There are ten pearls on the shield of the original emblem, which were changed to rubies as each of the 9 original members and Dad Land passed away. (The first to be lost was one of the young men, killed in an accident in 1921.) Far more sweeping were the general changes made to the emblem by Land himself. He was personally interested in heraldry, and probably took great relish and pride in designing and developing the sigil of his order over the years. The first revision came in only the second year of the organization! It was followed by another in 1932, and the current version, which has lasted since 1949, and will probably never be changed again. At least for the first 30 years of the organization, however, you can nail down the period that an object comes from based on its emblem. After ’49, it opens a up a little wider. Just as it has had several designs of emblem, so has some of the regalia of the order changed over the years. Surely it will come as a massive surprise to anyone who follows this blog to hear me say, “And they wore fezzes!” At one point, anyhow. Back in the 1920s-early 30s, officers (at least, I don’t know about the general membership) wore a couple of different hats. I know this because I have them in my collection. At various turns, and perhaps even overlapping, chief officers wore fezzes, and they also wore Scottish Rite-style caps. 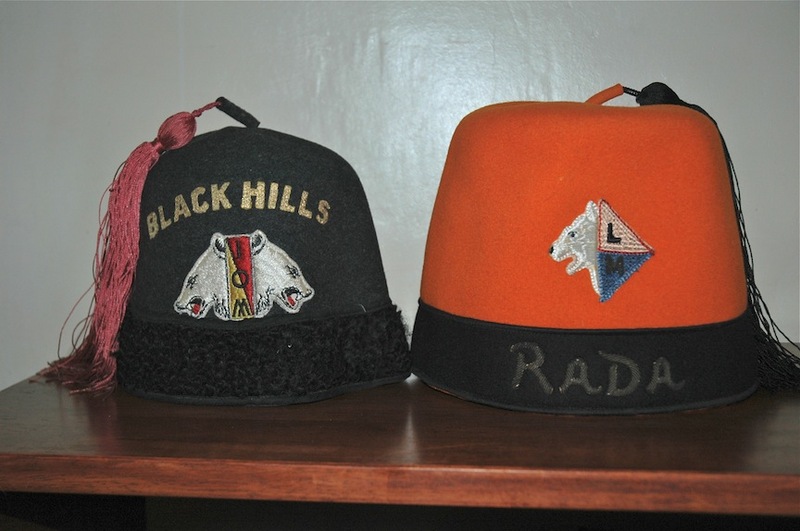 Again, I can see that the periods represented by these hats either abut or may even overlap, because of the use of the 1920-1932 emblem on them. “Attack” might be a strong word, considering my actual findings. Unfortunately, moths can go from 0 to 60 very, very quickly when given a fertile field in which to play. There are certainly products out there to prevent that, but many are themselves damaging to cloth and other textiles, and most are poisonous. I don’t put poison on my collection. By going through and counting, one by one, I also managed a quick condition and maintenance check, throughout. Everything looked good, I moved a couple of pieces from one case to another, re-organized a bit to better fit their spaces. Dandy. Until I got to my large “Non-Masonic” case. Mind you, this is the only case I have that doesn’t have a foam seal around it, a throwback to an earlier generation of storage for my collection. Why I haven’t updated that case, I cannot say. It is the largest of my (7) cases, and the sealed models I use now don’t come in that size. Maybe it was a reluctance to have to break up that grouping into more than one case, and thereby add onto the space necessary for the whole mess. I guess. It makes no sense, actually. 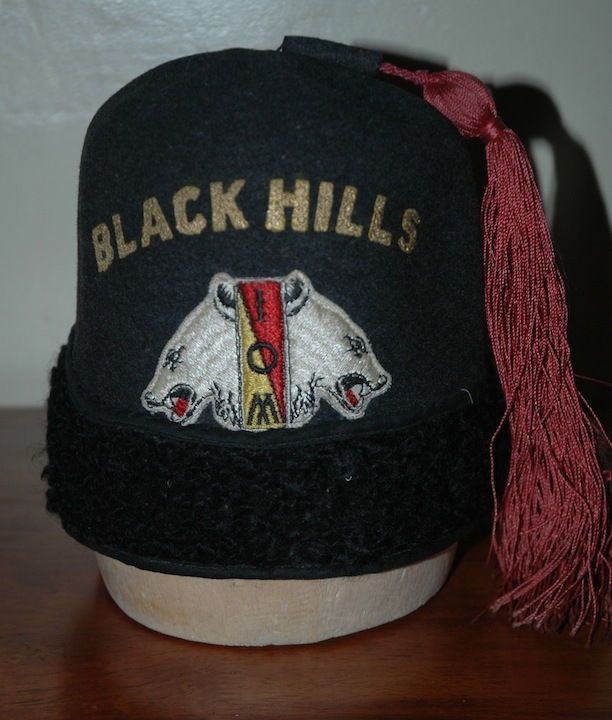 I have a sealed case for the Shrine hats that I generally dismiss as my “extra” Shrine fezzes; why don’t I afford the same to my far more interesting and difficult to collect “Non-Masonic” pieces? Regardless, at the bottom of that Non=Masonic case, I found grit. Hmmm. Why is there grit in here? I swiped it up on my finger, rubbed it between my thumb and fingertip. It was kinda greasy. Ohhhhh…no. It felt like moth damage (to be precise, I guess it would be moth…errr…stool) to me. Disaster! Moth damage is pretty obvious: usually a strange, granular pellet-sized blob, usually next to or within a divot in the wool. It is actually the larvae of the moth that does the damage. A moth lays eggs on wool, the eggs hatch, and the larvae feed on the wool before cocooning and turning into new adult moths. Sometimes you will find the granular mess, occasionally the cocoon or the grub actively feasting on your hat, sweater, or rug. Fast forward to today, when I have a day off from work and the time to address it. I took each and every hat out, looked them over closely. Weirdly, I only found one hat (my Moose Tah) that had any sign of moth activity. And that, only one small spot. Huh. Of course, MANY of my fezzes arrive to me with moth divots, some of these hats having lived even a century in an attic or old drawer. I always look, to make sure they don’t have any visible critters when they come in the mail! However, if one hat has a problem, there’s a good chance that others are getting there soon enough. Hello, freezer. I bagged up all of the fezzes and the Tah from my Non-Masonic case, four separate bags so I could fit them in where I could, and put them in my freezer. I will crank down the temp so it bottoms out just below zero, and I will leave them there for about 5 days. That should do the trick. As always, I cannot tell you the best thing to do with your own collection, I can only report what I do with mine. One of the up-sides of living in the desert is that we have very low humidity, so when I bag up my wool hats and throw them into the freezer (which is also a very dry environment, actually), I don’t have to worry about ice. Were I living in Louisiana, that would be a problem. The high humidity not only around the hats in the bag, but also permeating the wool, could very well condense and form microscopic ice crystals throughout the cloth. Ice is sharp. Ice destroys textiles from the inside out. And when the hats came back out, that condensed ice would melt and add liquid water to the wool, which is also bad. Were I in Louisiana, I would be well advised to somehow de-humidify my hats before I froze them. I have no idea how to do that, however, since de-humidifying is not something we often do in the desert. So I am glad, surely for that reason alone, that I do not live in Louisiana. My little adventure, however, underscores the necessity to periodically check your collections, whatever they are. Are they safe? Are they clean? Are they properly closed? Are they out of the sun? Are they pest-free? It would be a shame to someday open your box of widgets and find a pile of moist widget-meal crawling with vermin, rather than your wonderful collection. If only you had looked in the Spring, when maybe there was only one widget weevil in residence! Woe to the widget. You can take that question any way that you want to. A good portion of Freemasons will scoff at the very idea, actually. That’s okay with me, because it is a question, not a thesis or a positive statement. The question occurred to me when I was spending time with the document/object that is the subject of this post. It is a question worth pursuing, I think, even if the answer is a shrug, or a big red zero. Many will probably be with me, however, in the supposition that such will not the the total answer, almost no matter what. First off, I want to clarify and simplify. I belong to a so-called “mainstream” Masonic Grand Jurisdiction—I prefer the more current term of State Grand Lodge, a non-loaded distinction from Prince Hall Grand Lodges—and so when I make first person references, whether singular or plural, I am referring to the Masonic constellation to which I belong. And I will refer to other Masonic obediences or groups in the third person. That’s just language. I don’t in any way mean for this to be an “Us vs. Them” discussion, even if those are the pronouns I use. I want to explore this little document objectively; I would be sad if someone were to assume that I am approaching this from a predisposed, dismissive perspective. Just because this document comes from another Masonic obedience, one that my own tradition refers to as “Clandestine,” again—those are the words that I have available to use. I don’t feel the need to coin new terminology for this discussion. Second, for those Masons who sniff in disgust when someone studies something that they feel to be outré, I can only assure you that I am very comfortable with the regulations and laws of my Grand Lodge. More than that, I am very comfortable with my Obligations, and I adhere to them. Even admiration for the Clandestine, if that is where this stream of thought ends up, is no declaration of any wild intention on my part. Chill. 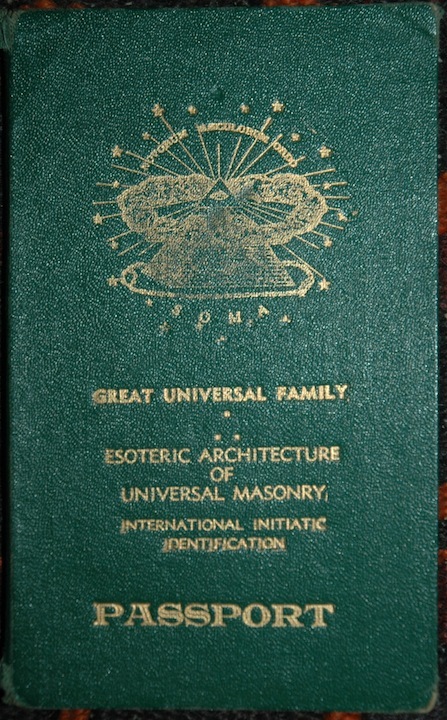 Grand World Confederation of Rites and Jurisdictions of Universal Masonry, the A:.F:. and A:.M:. and all other legitimate rites, higher Initiatic Bodies and Spiritual Sanctuaries—Great White Brotherhood. World United Supreme Council XXXIII. 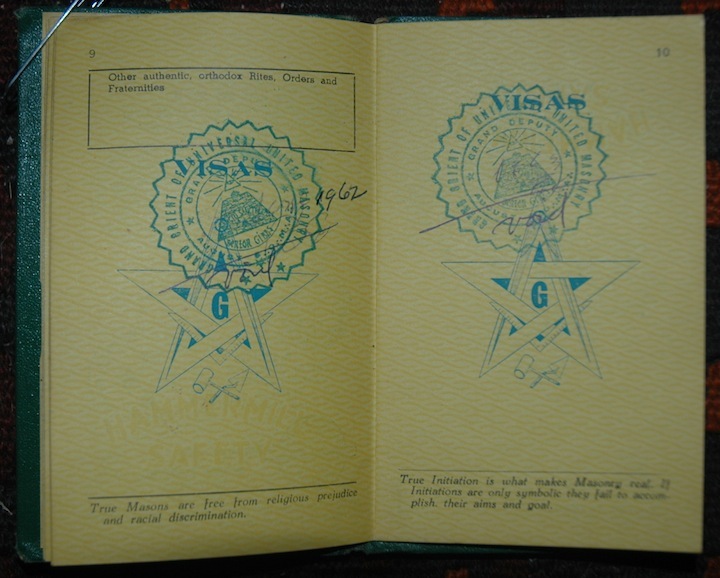 The document is absolutely loaded with seals, sigils, stamps, initials, official marks, and other bits of officialdom. By the looks of it, SOMA was the umbrella for a pretty wide-ranging group of organizations, both here in North America and abroad. 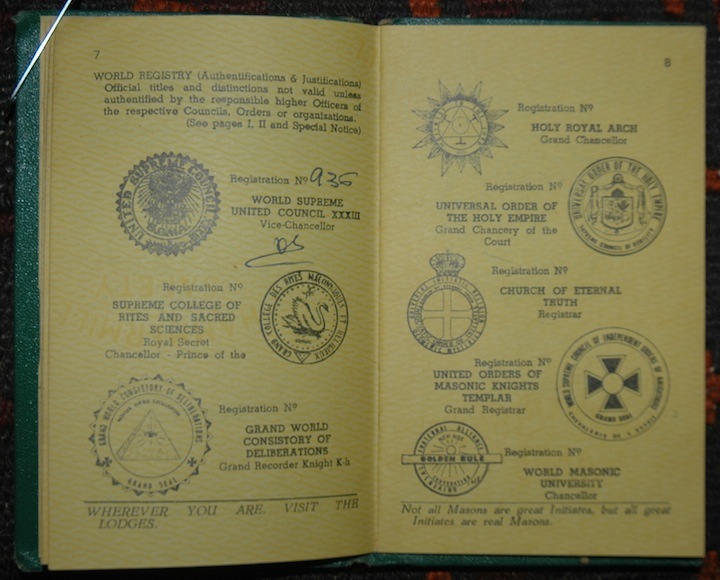 There’s quite a bit of French here and there throughout the passport, and as you can see above, one of the seals of one of these organizations sports an Eiffel Tower. Now, honestly, this could mean one of a few different things. It could, to be honest, be a lot of smoke: Sometimes on organization may pump up its stature and credit by claiming international association and jurisdiction, even if that is shaky at best. This is a common behavior, and y’know…okay, big deal. It could be a matter of lingua franca. This might tie in a little bit with possibility number one, the supposition that it would be necessary and warranted to be using the international language in this document. (For those raising an eyebrow, in times past it was French and not English that was considered the international language. The term itself, for heaven’s sake, literally means “The Frankish tongue.”) You will still find a good deal of French in your US Passport, for that matter. So this might have been done to underline the nature of the thing as a genuine passport, in its own right. It could be a nod to French Masonry. Freemasonry in France has long been the most “liberal” (a very imprecise term) in the world. I won’t go into it here, but the French (and Belgians, I think) have always been off in left field from the rest of the world (read: UGLE-affiliated) of Masonry. And thus, most of the world actually holds the preponderance of French Masons as Clandestine. Not being a part of this organization, or constellation of organizations, I must admit to some difficulty navigating the import of some of this. 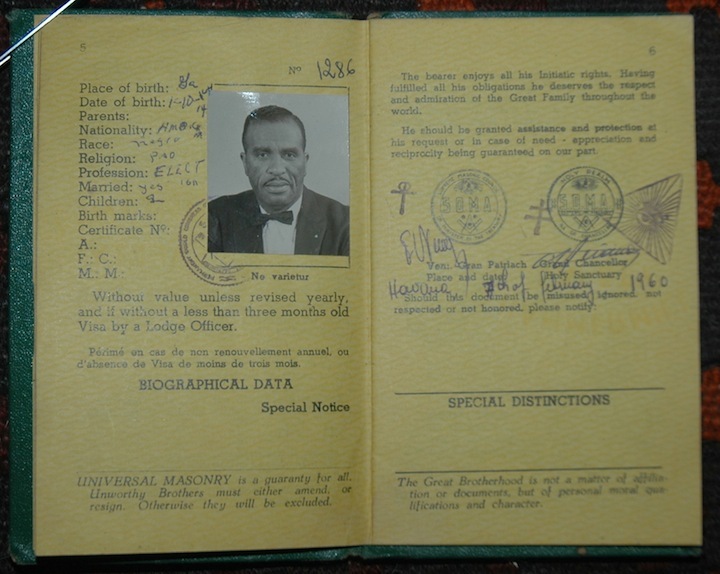 But from what I gather, as Mr. Jones joined various bodies under the SOMA umbrella, his passport would have been updated with a membership registration number from each, next to the respective seal. From the looks of it, Mr. Jones only ever joined the one organization, the one at the top: the World Supreme United Council XXXIII. Kind of cool, actually. I can see how this might have been a very satisfying document to have and live with, as you gathered nods from various organizations and their executives. Again, worthy of consideration by anyone in any walk. For all the cool symbols and stamps and seals, I think it really is the aphorisms or maxims at the bottom of each page that are the most particularly interesting part of the Passport. More than all the rest, which might be seen as perhaps a little overblown and postured (there’s a total of 21 different organizational seals/symbols in this little booklet…that’s a lot), the character of the organization is revealed in these phrases. Maybe it’s just rhetoric, who knows. I guess that depends on the individual member to decide and exemplify through their actions. This is true of any organization or group which has a stated purpose and philosophy, including my own Lodge and Grand Lodge. There are those who see the rhetoric of the organization to be merely window-dressing, because hey, they have big plans and ideas of their own, and it isn’t important to them that their activity or point of view is antithetical to the values of the fraternity. And there are those who take those values personally and seriously, and attend to them with vigor. I think one of the most important and most interesting of the aphorisms is at the bottom of Page 9, seen above. Younger Masons these days might not really know why that is a truly poignant and affecting turn of phrase. But remember, this is from 1960. The long game of the Civil Rights Movement—which stretched back to the mid 18th C—was just gaining the steam it needed to finally break through and solidify gains. In 1960, four black guys sat at the Woolworth’s lunch counter in Greensboro and were refused service. 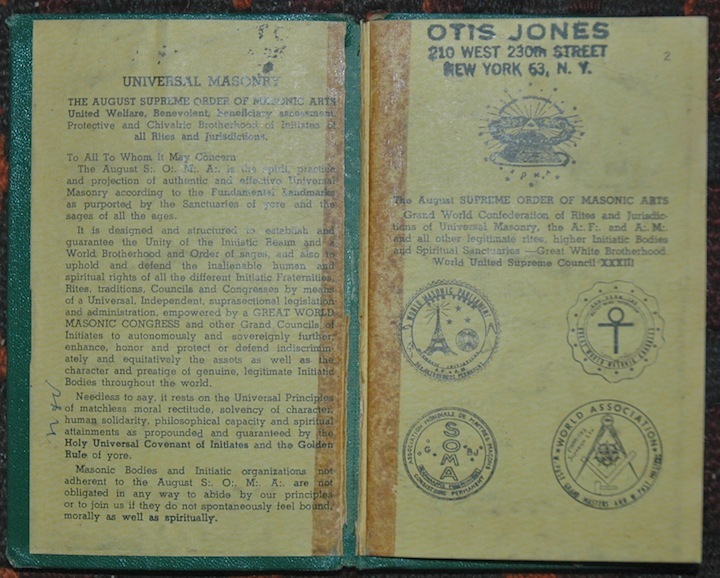 That’s what was going on in the news when Mr. Otis Jones joined this branch of Freemasonry. The country was gearing up for some serious showdowns, which would develop over the ensuing years. And Freemasonry remained far, far behind the curve on all of this stuff. And in many states is still way behind! If we take this Clandestine group at face value of their maxims, however, we have before us a group that, at least in one matter, was more Masonic than our own Jurisdictions. And they were absolutely right, at least from my reading of the tenets of Masonry. Worth noting. So I look around at some of the Clandestine groups (the honestly legit ones, not the fly-by-night lodges or the expensive degree-selling scams) and their ideas. I ask myself, “Why did they break away?” Most current Clandestine Masonic groups seem to be formed by regular “mainstream” Freemasons, probably even in good standing, who for some reason feel that their Grand Jurisdictions are not getting it right, and they set off on their own. And I would imagine that in many, many cases, they give up a great deal in order to do that. Like I said, I’m very comfortable with my Grand Jurisdiction and my obligations. But I won’t turn up my nose at the thought of examining the beliefs of others. This Passport may not represent my accepted world of Freemasonry, but they definitely were getting something right, when my own Masonic forefathers were still laboring, at least in this matter, in comparative darkness. What’s Up With This Fez? Anybody that collects fraternal objects probably knows what I mean, that sometimes you just get kinda tired of Shrine stuff. Good Lord, there’s so much Shrine material out there! Of course, I love all of my fezzes and medals and whatnot. But anymore, it’s rare that I run across a Shrine piece, especially a fez, that warrants a second look from the collecting perspective. There’s a million of ’em, and they’re all pretty similar, mostly falling into three or four schools. This Ararat Temple piece was a recent example of that. I’ve never seen another like it. Mid-century, maybe 1950s? 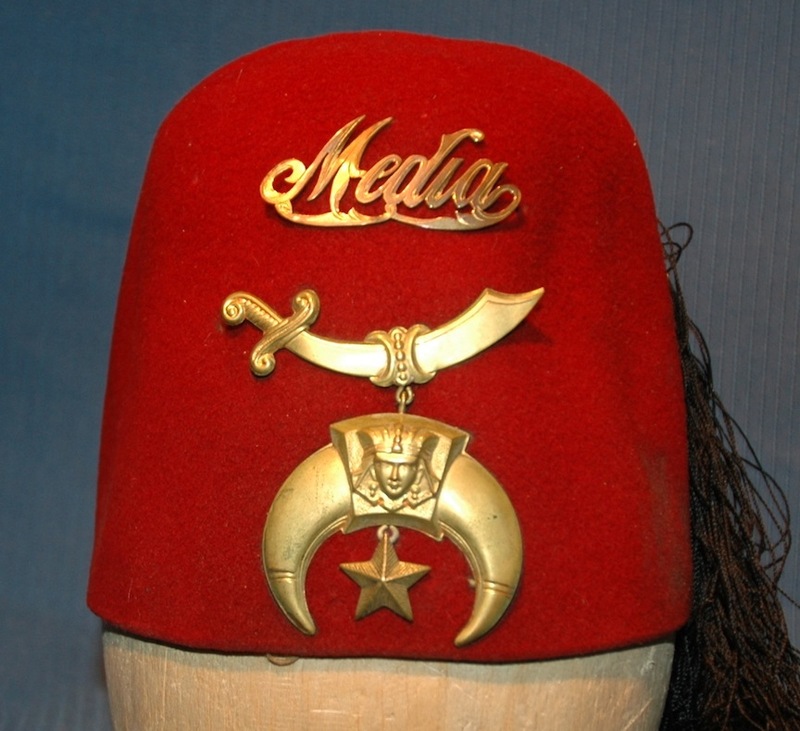 My Media Temple fez is another, and even more particularly odd. The Ararat hat at least is made of wire, stitched into the felt of the hat. 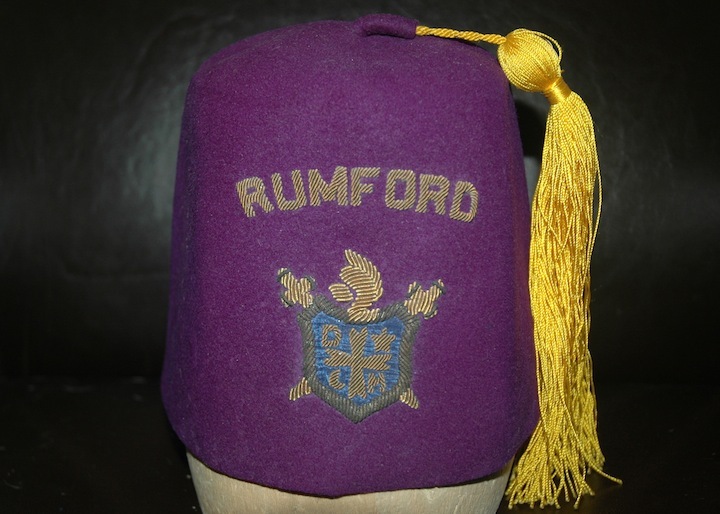 In some ways, it is still a pretty standard fez, except that the emblem is almost entirely that wire framework. The Media fez, however, is totally unique and bizarre. You can see why! 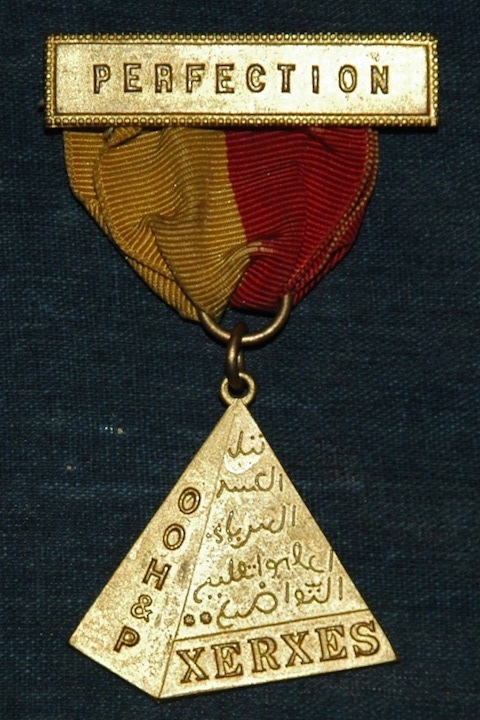 The name and emblem are just what they look like, solid plates of metal, punched and pressed, 3-D, and then joined to the fez with brad-like connections. The Temple name has a mirrored, somewhat rainbow surface, and I think it is plated in silver. Completely oddball, and fantastic. This is one of my favorite things in my collection. As I’ve mentioned elsewhere, one of the really interesting, even engrossing, factors that guides and inspires my collecting is the personal connection that so many of my pieces represent. 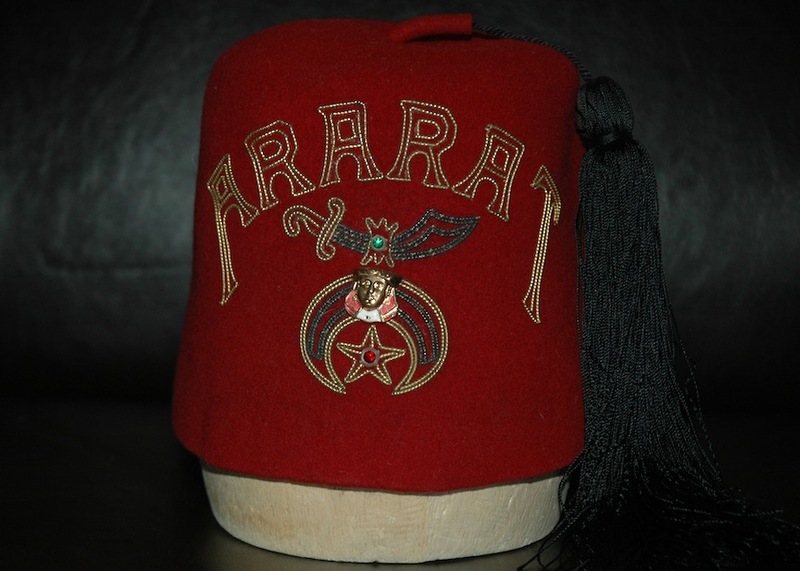 A fez, which is little more than a used man’s hat with no monetary value when considered objectively, was a badge of fraternity and pride to the man that wore it. A photograph was a keepsake, a frozen memory of some event taken part in by one guy and all of his friends. Good times captured and kept. This piece, this Corn, Wine & Oil set, exemplifies this quality. Not only is it a rare and unusual thing (I’ve never seen anything else like it in all my years), but it has an intensity engrained within it. Right off, I have to say that there are really two things here, and I have no reaon to think that they were kept together during the useful life of each. 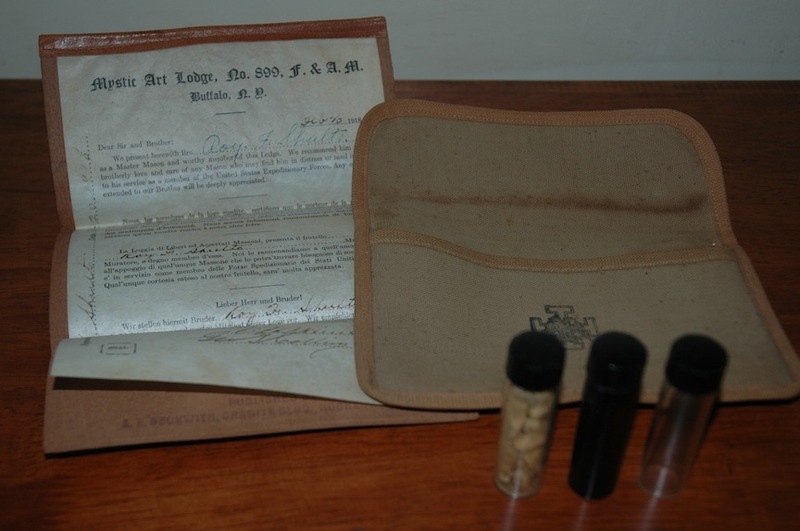 The letter and AASR pouch are really one thing, and the vials are another. But they came to me together, and I keep them together. Whether he did, is doubtful, but possible. We present herewith Bro. Roy F. Shults , as a Master Mason and worthy member of this Lodge. We recommend him to the brotherly love and care of any Mason who may find him in distress or need incident to his service as a member of the United States Expeditionary Forces. Any courtesy extended to our Brother will be deeply appreciated. The message, on an oiled paper, and signed at the bottom by the Master and Secretary of the Mystic Art, is repeated in French, Italian and German. Of course, this is logical, those being the primary languages likely to be encountered by a member of the Expeditionary Force. But it is notable that in including German, there is a recognition that regardless of combatant status, regardless of whose side the man might be fighting for, it would be perfectly reasonable to expect relief from a German brother. And carrying such an object on one’s person would also, as a corollary, remind Bro. Shults that in like manner he is charged to relieve any Brother in distress, also regardless. It is a profound expression of the spirit of Freemasonry, to carry this document in good faith. After receiving a second UOSP medal in the mail, and upon putting the two in a drawer with their cousins, it occurred to me that I have a nice little clutch of medals from extinct IOOF appendant groups. 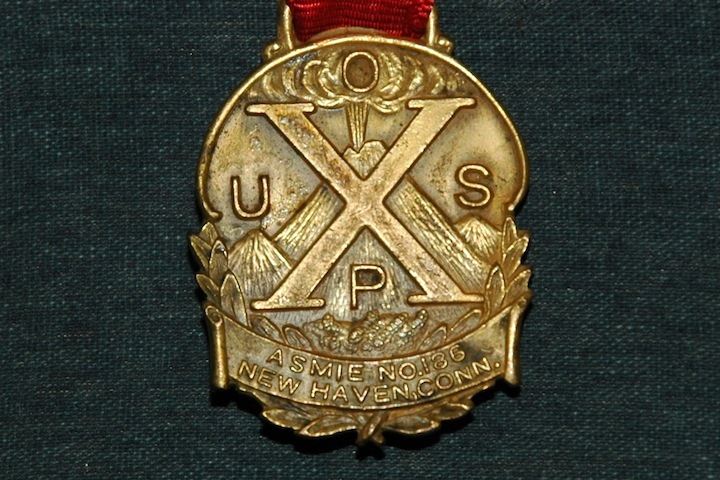 I think it’s odd, that I have two pieces from the UOSP, an organization which existed for 2 years or less; yet I don’t have, nor have I perhaps even ever seen a medal from AMOS, the successor to the United Order, which has existed for 90 years. But such are the ironies of collecting, I suppose. These are nice pieces, interesting, and I’m glad to get them cataloged and updated here. There’s a story here, by the way, told in little symbols and complex emblems. One of the earliest pieces of this story can be seen at left, the front page of an OOH (no P, the P came later) ritual book, which I found in pdf format at the LOC. 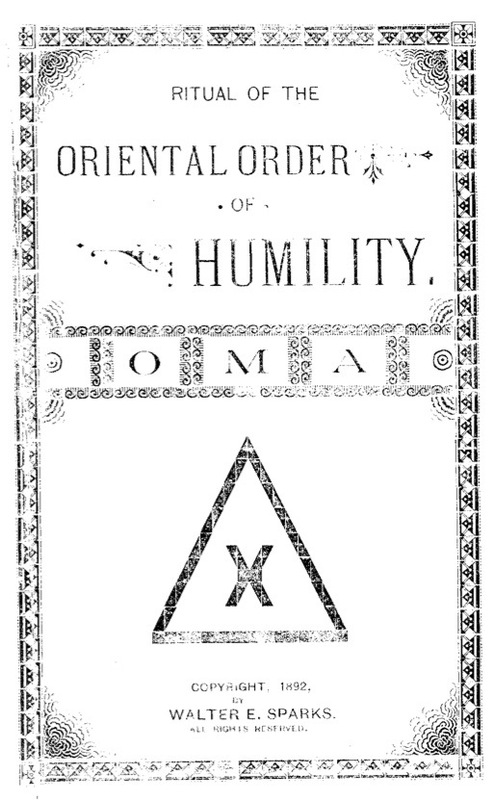 The Oriental Order of Humility & Perfection (OOH&P) was the longest-lived and probably largest of the early IOOF appendants. I base that claim on research done by Seth Anthony, as well as the density of OOH&P objects that crop up, from fezzes to medals and so forth. (Strangely, however, a search in newspaper archives that yield a good amount of information on, say, the Imperial Order of Muscovites, turns up almost nothing for the Oriental Order.) The running symbolic narrative that stretches from the mid 19th Century OOH, through to the AMOS emblems of today, primarily uses the vocabulary of the OOH&P. The UOSP was formed in 1924, under pressure from the Sovereign Grand Lodge of the IOOF. The Muscovites, Knights of Splendor, OOH&P and Cabiri had been deemed by the uppity ups to be unfit movements for Odd Fellows, and the UOSP was created to absorb these rascally renegade groups and provide an appendant body more in line with what the SGL of the IOOF saw as appropriate. Now that I write that…the UOSP sounds awfully, dangerously, horrendously boring. Maybe that’s why the UOSP was a complete flop and folded after only a couple of years. Let’s face it: when The Man tells you that your fun side-order is out of line and forces you to do something else that is more under His control, is that really the party you want to go to twice a month? The IOOF continues to have an odd (sorry) relationship with its appendant body. The Ancient Mystic Order of Samaritans, which as I mentioned is coming up on its Centenary, isn’t actually recognized by the IOOF. It is, as far as I can tell, tolerated. A couple of years ago, while attempting to research the history of the Muscovites via high-end officers of the Odd Fellows, and mentioning that the IOM had been a precursor to the Samaritans, I had a Grand Secretary somewhat curtly inform me that the AMOS are referred to as “the cast out” and pretty much refused to discuss anything else with me. Why exactly the IOOF has decided on this course of action is a mystery to me (and it’s none of my business, frankly); but to this day, appendants and Odd Fellows hierarchy seem to discreetly look past each other. These are my Imperial Order of Muscovites fezzes. 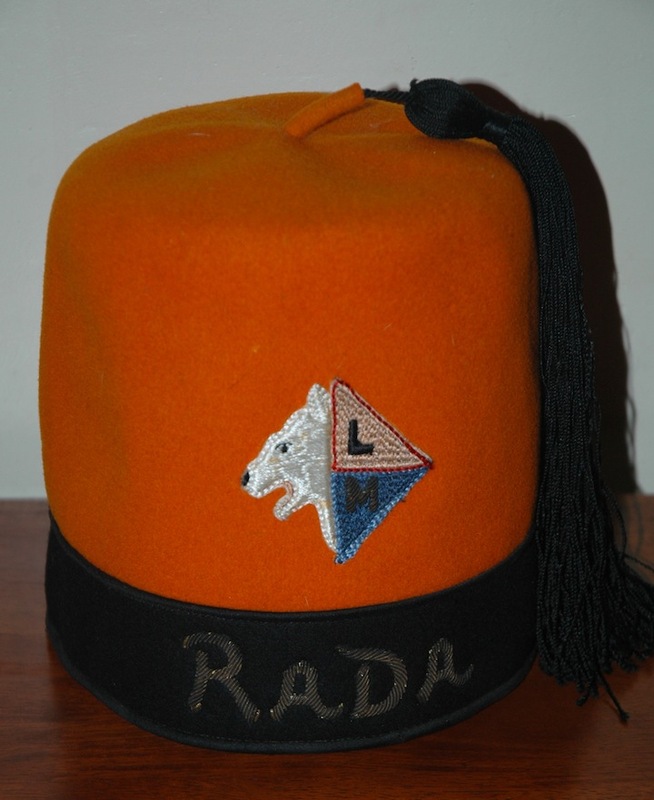 The grey fez is an IOM piece, and the orange is a Lady Muscovites hat. The IOM fez proper I found in a local antique store, the LM fez I recently nabbed from eBay. They are insanely rare fezzes, from orders that are all but forgotten, known only through searches of early 20th Century newspapers. The Muscovites were an unofficial appendant body of the Odd Fellows here in the US, rather short-lived and seemingly always in trouble, whether with the parent body or with money issues. As with many small fraternal orders of that era, the Great Depression ultimately sealed their fate. It was the collection of the IOM fez back in 2009 that got me really dialed into researching my fez collection and taking it far more seriously. Two of the pride and joy pieces of my collection! I actually have not cataloged them yet, for whatever reason, so they have no catalog numbers at this time. Detail images below.